This is a sample of what we can make for you. THIS SAMPLE PICTURE IF FOR A YOUNG CHILD. This is a great for you to decorate as your own. If you purchase this listing and provide me a size smaller cup then your size, I will not start your order until you've paid the difference of the size. Please verify what your bra size is when you purchase so that i can make it for you. Please note that all natural materials is unique and not duplicated so lauhala will vary from the picture but I do use materials that is similar to the picture. Tahitian And Rarotongan/Cook Islands Headpiece.. Red & Yellow Feathers, Tapa Cloth And Lauhala. Perfect For Dancers Of All Ages! 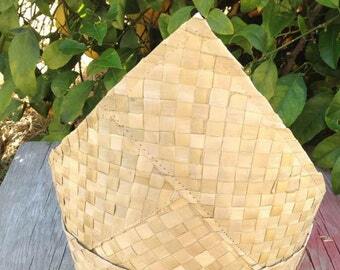 Authentic Polynesian Natural Materials. Lauhala/Laufala/Lo'akau Flower Clip..Perfect Sei For Polynesian Dancers, Luau, Gift Or For Wedding! !